Home Uncategorized Happy Book Birthday, GIANT SQUID! Plus an Interview with the Amazing Candace Fleming & Eric Rohmann! 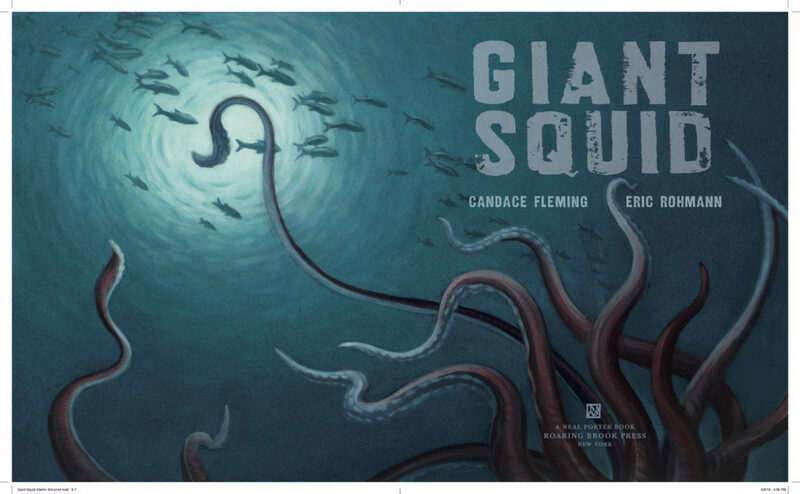 Last spring I got a sneak peek of a book that bowled me over, Candy Fleming and Eric Rohmann’s Giant Squid. It’s unlike anything I’ve seen before. Take a look at this opening page. 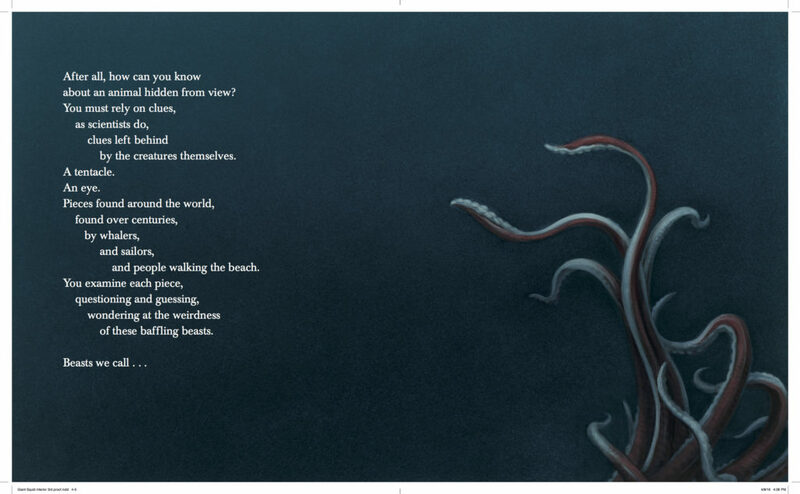 That glimpse of tentacles waving in a vast full spread of undersea darkness? Gives me the shivers. The entire book has a lush, theatrical feel. Words and pictures combine in a way that makes it seem like you’re watching a movie in an IMax theater with some deep-voiced guy narrating in surround sound. And get this: Like a movie, this book has a five-page intro/buildup before we even get to the title page reveal. So, Candy, how did you come up with the idea for this gem? Explain your brainstorming as you shaped this book – the decision, for example, to never show the entire creature until … well, I’ll just let you tell us. After all, that’s exactly how naturalists and scientists have learned about the giant squid, part by part. 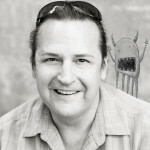 Only in the last decade have we glimpsed the creature in its natural environment. For the most part, our knowledge has come from studying pieces of giant squid washed up on beaches, or from bits found the bellies of sperm whales. Both of us loved the idea of a book about giant squid that could be read in the same way scientists have collected data about them. Page turns mirroring the slow discovery of what we know about the creature. We were mostly intrigued by the mystery of the giant squid. Think about this: giant squid are so elusive that scientists cannot definitively say how many live in the world’s oceans. But judging from number of beaks found in the digestive tracts of sperm whales and albatrosses the population must be at least in the hundreds of thousands– and yet we know next to nothing about their mating habits, or schooling habits. We’re not sure how they hunt, or mate or raise their young. That “not knowing” became the book’s focus. This premise forced both of us to think out-of-the-box in regard to science nonfiction books. Typically, these types of books provide the reader with facts about a particular subject. Giant Squid, however, does the opposite. It emphasizes what we don’t know, its text full of as many questions as hard facts. Adding to this mystery is the giant squid’s habitat. 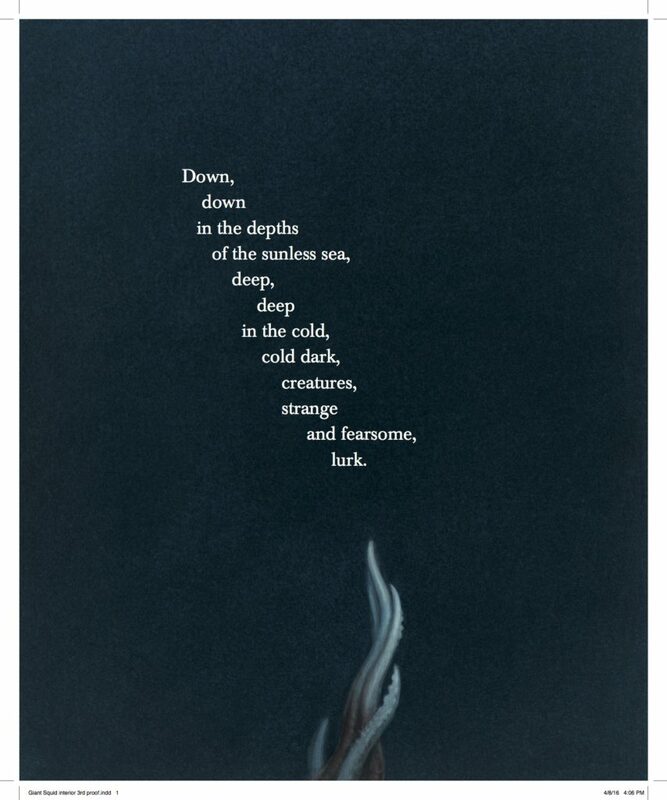 There aren’t many places darker, stranger and scarier than the deep sea. What’s lurking down there? There are people who won’t even dangle their hands in the water for fear of the unknown. What could be a better, creepier, more mysterious setting? I would like to write that all this brilliant thinking occurred while we sat in that restaurant, Eric sketching away on a napkin. It didn’t. But the original impulse began there. I would also like to say that I was onboard this project from day one… napkin day. I wasn’t. 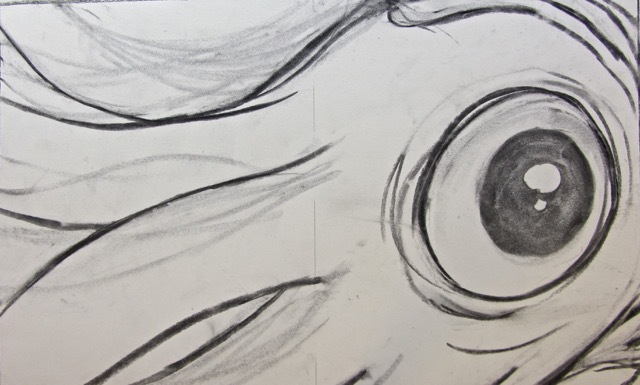 This was Eric’s project originally, fueled by his curiosity and passion for giant squid. (And he does have a passion for them!). In fact, he had already written a text and created a storyboard when I stepped into the project. He wasn’t satisfied with what he’d written and asked for my help. I agreed, but there was one problem. The book already had illustrations. It already had a solid storyboard with page turns and structure. I was going to have to work backwards. 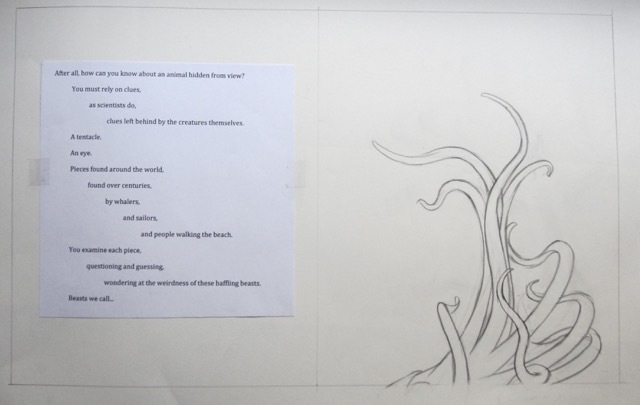 Instead of writing a picture book manuscript that would subsequently be interpreted by an artist, I was challenged with writing words that fit with the art. Happily, Eric’s writhing, lyrical sketches and preparatory art inspired an equally writhing, lyrical text. The book arose this way: I responded and wrote after looking at Eric’s art. Then I handed it back to him and he added, subtracted and altered his images. Then back to me and we repeated the process until we arrived at the story you see when you open the book. It was a disorienting, exciting, frustrating, challenging joy to make. Once we had completed text and preparatory art, we looked even more closely at the entire book as a whole and again made changes. It became immediately clear that the title page, as well the book’s front matter took the reader out of the deep ocean and onto a page. We wanted them to feel as if they were in deep sea with the giant squid without explanatory text or front matter to push them out of the experience. In the end we chose to start the story—in a manner often done in film– and move the title page back to page six. Jill: How involved was your editor? Candy: Throughout this process, our editor, Neal Porter at Roaring Brook Press patiently waited, advised, encouraged and nudged us forward. Eric had originally wanted to use a printmaking technique called monotype to make the images. This proved difficult and after a few months of false starts and inadequate results we put the project on hold. In fact, we abandoned it. But Neal would have none of it. His faith in the book, his vision for what it should and would become never flagged (often to Eric’s awe and irritation!). So he went back to the studio with renewed energy. Two months of work and he still was not happy with the results. With four months left until the deadline, Neal visited us and his enthusiasm (and Eric not wanting to let the project just dangle) got him started again. With such a short amount of time to make 19 images, Eric turned to oil painting, a technique that he has used in the past, as well as one that required less process and would fit the book well. The result is the book you see today. Jill: People, honestly, you have to see this one. 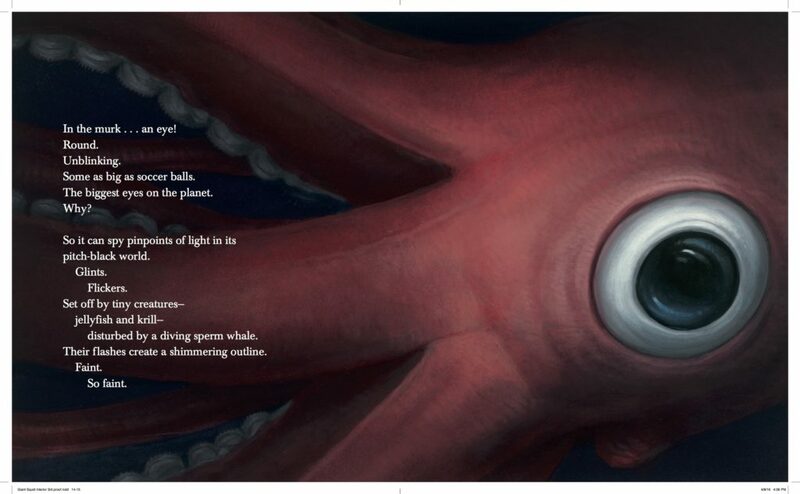 Giant Squid releases today and has already garnered starred reviews from SLJ, PW, and The Horn Book. Released last week, also to rave reviews, was Candy’s Presenting Buffalo Bill: The Man Who Invented the Wild West. Gallop on down to the nearest bookstore or library and take a look! Thanks SO MUCH for visiting with us, Candy (and Eric)! Always fun spending time with you. WINNERS! WINNERS! WINNERS! WINNERS! WINNERS! WINNERS! WINNERS! Ashley Bankhead! 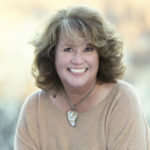 You won the Skype Q&A author visit with Suzanne Slade for Mrs. Heathcock’s 5th grade class at Hillsdale Elementary in Meridian, ID. Woot! Please email Suzanne through her website (www.suzanneslade.com) or have the teacher email her directly to set up the visit. Patty Toht! 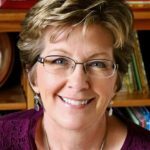 You won a copy of Suzanne’s new book, The Music in George’s Head. Congrats! Also, a brief FYI: Our friend Pat Zietlow Miller has a super busy autumn ahead, so she’s taking a break from blogging (don’t worry; she’ll be back in January). Stepping in to fill her always-fabulous shoes is former PBB member Barb Rosenstock. Barb will bring us a series of interviews with big name (think their own imprints) editors. How cool is that? I KNOW! Stay tuned! Thank you for sharing your journey, challenges and all, in creating this intriguing picture book. I’ve been looking forward to this book! I spent a long time writing curriculum and lesson plans on the Smithsonian text, “Giant Squid: Searching for a Sea Monster,” which I thought was a fabulous text with strong point of view, so I’m excited to compare this beautiful treatment. Thanks for this interview, which describes their unusual process and what looks to be a very unusual book. Also looking forward to Barb’s interviews – how awesome for us! Ooh… such a mysterious creature deserves a book full of mystery and intrigue. I love the idea of a nonfiction book with more questions than answers. Maybe this will inspire a child who will grow up to answer the questions presented in this book. This book looks like such a wonderful marriage of text and illustrations. I can’t wait to get it in my hands. I’ve worked with Candy Fleming and Eric Rohmann at a few Highlights workshops. They are an amazing team! Each of their books is a treasure. Thanks for sharing their interview. I took a class with Candace earlier in the year and she shared a few glimpses of this book with us. I am SO excited to see this book in print and can’t wait to get my own copy! I love that idea of working backwards — from illos to text. What fun! And what a beautiful book it produced!!! This book looks amazing!! Can’t wait to get my hands on it! Fascinating subject, gorgeous book, and how interesting to read about the author/illustrator/editor process. I love the reminder of how long it can take for an idea to come to fruition–from a napkin in 2008 to this glorious book eight years later, with a few detours in between. Congrats to all! This is definitely my kind of book! I can’t wait to read it! I loved hearing about the process behind the book, and the fact that Candace worked backwards–how fascinating. And I can’t wait to learn more about this incredibly elusive creature. Thanks, Jill & congrats, Candace! What a great interview, Jill!!!! And gorgeous book. I remember how excited you were after seeing the galleys at the conference. I never could corner Eric for a peek. Can’t wait to see it and I loved hearing its backstory, thanks! Wow! What a book, what an interview. The backstory helps so much to learn patience and perfection. Thanks, Jill. It’s on order. Good luck to you on your fall activities. This is a book I’ve been waiting for! Congratulations to Candy and Eric, and thanks for the great interview, Jill. And oh, my! I won a copy of Suzanne’s new book? Sweet! Another thanks to PB Builders! This looks fantastic! And haunting. And oh, so cool! Loved the interview, the backward process, Neil Porter’s faith in the book, everything! Thank you for sharing this interview. The process that Eric and Candy shared is interesting and even more so knowing that it all began on a napkin. I love the focus on idea generation and process in this post. Giant Squid looks to be a fascinating read. Thank you! Gosh, this looks so gorgeous and lyrical. I’ll have to get this one! Thanks for featuring it, Jill. Congratulations! 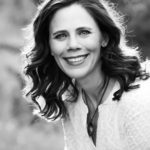 I have always loved reading blogs about new books, but now that I am actually meeting some of these awesome people, it is even more exciting! According to Amazon, I should have a Giant Squid appearing on my doorstep today! Thanks for this post, Jill, and thanks for writing the book, Candy! I absolutely love the book! And this interview provides so much great insight! Thank you, Candy and Jill!